Last month, I have worked on a requiremnt with public webiste which using Office 365 SharePoint Online and allow anonymous user submit/add data to a specific list. 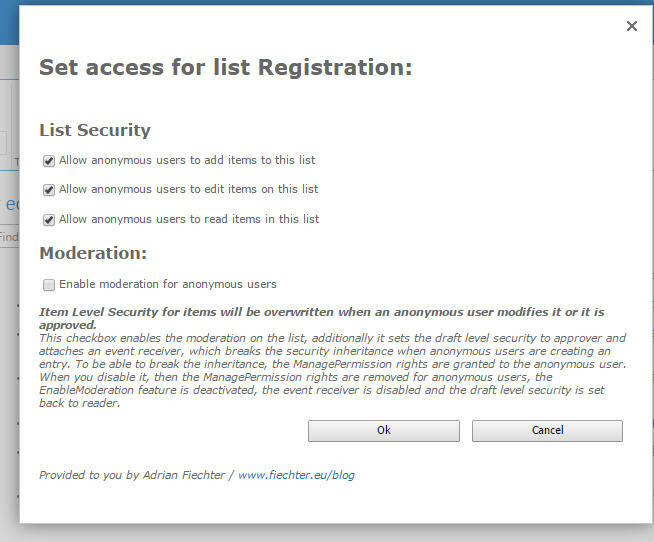 As your know, When you enable anonymous access to a Web site, you allow anonymous users (and authenticated users who have not been granted access to the site) to browse the entire Web site, including any list, library, folder within a list or library, list item, or document that inherits its permissions from the Web site. The issue come from Anonymous cannot submit a Contact Form or a Registration form. That mean, in technically, we can not save information to SharePoint for further requirements. But happy to know that, there is a customized sandbox solution Wsp365.Anonymous.wsp to allow Administration grant Add/Edit permissions to Anonymous user for any custom list. You can download the solution here, or codeplex, then upload it to https://yourpublicsite.sharepoint.com/_catalogs/solutions/Forms/AllItems.aspx, Active it. Back to your list, your will see a new ribbon button.